Longarmers: Want to be sure you have a straight edge along the top of the quilt, but don’t have a horizontal channel lock function on your machine? Use a small C-clamp like this on the vertical track of your machine. It will allow you to baste a stitch a long straight line on your batting for you to lay your quilt against. With one straight edge, you can square the others accordingly. Of course, you remove the clamp before quilting. Note: many great longarm machines do not have a channel lock feature on them. The channel lock is made with magnets, which are heavy. They add a lot of weight to your quilting machine, which may not be ideal for dense, custom quilting. Yes, there are fancy laser lights that you can get, but this is cheap, easy, and you know you already have what you need in your garage. 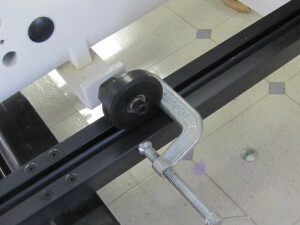 The clamp is placed temporarily to allow a perfectly straight stitch line as a guide for your quilt edge. Thanks Pam! I will have to check those out. Bessey ratchet action spring clamps work also. One handed, Quick and easy to use. Use 2. One on each side of the wheel to lock it in place. I have an A-1…which is shown in your photo. I use larger Bessey clamps on the horizontal rail for vertical locking. Find them at Lowes.